Hi! I got a couple of new craft things over the weekend. I saw this new Sizzix die in the store and I know it looks like the old carry all box die but this one comes with 2 textured impression embossing folders and a "talking tag". 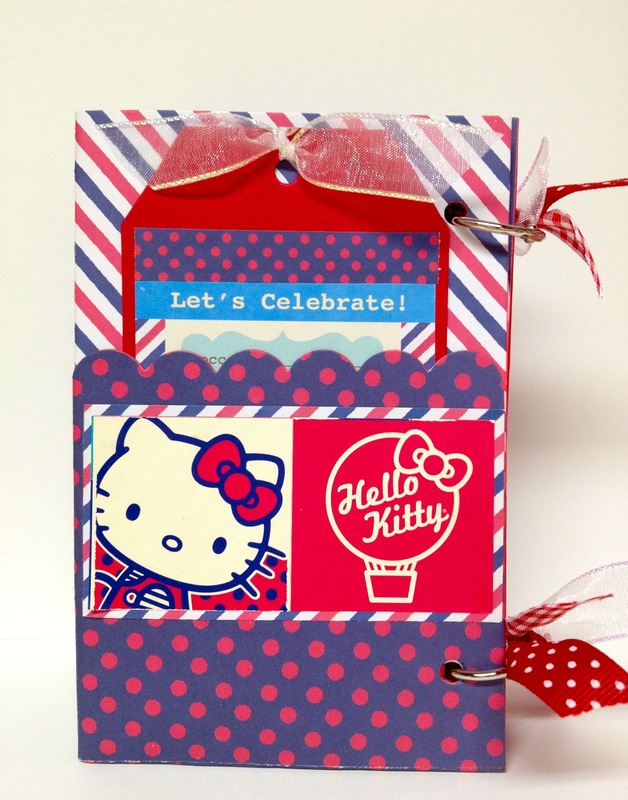 Talking tag is one of the latest thing that Sizzix released this past summer. You do need a smart phone in order to use it. But what it does is, you can record a message on this QR coded sticker and stick it on your project and the recipient of your gift can listen to your message. It is the coolest thing! Back to my box. 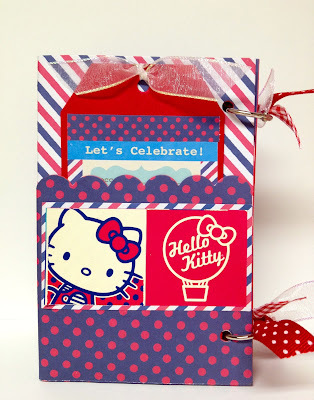 I used Dandelion Designs newest stamp called "sakura frame". And that "just for you" saying was sitting on my craft table from an earlier project so I decided to use it. I used one of the textured impression embossing folders for the front of my box and dabbed some white ink on the raised dots. I found this bottle of clear glitter in the store. It's called Tim Holtz distress clear glitter and I love the effect of it when I sprinkled it on the flowers. 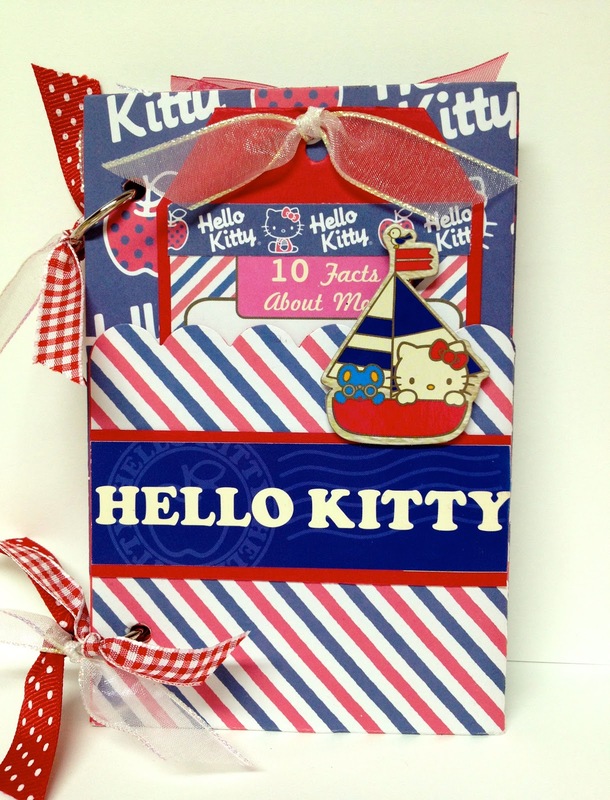 And before I forget, if you want to win some Hello Kitty products, leave a comment on the post below. I will be drawing the winner tomorrow - Halloween! Thanks for stopping by my blog today!!! Hi! 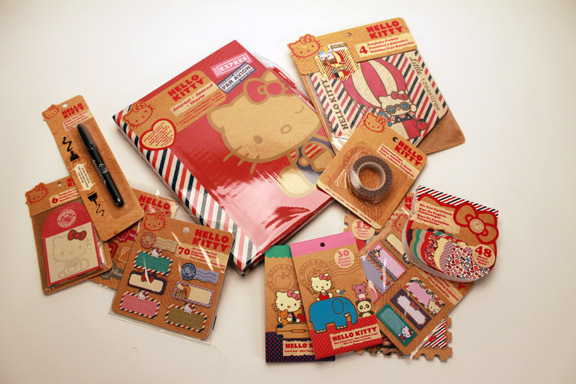 A couple of weeks ago, the great folks at Horizon Group USA sent me a box filled with Hello Kitty scrapbooking products, all for free!!! I was told that these items are only available at the Michaels stores on the mainland. These are the items that I received and much, much more! So here are a few things that I made using products from the kit. And I still have lots of it left. (Warning, very long post ahead). First up is a pillow box which is in the 12x12 paper pad assortment. I used a Sizzix framelit die for the frame on the box. I wanted to show the red cherry gumballs that I put inside the box. Next I used the square box that is also in the 12x12 paper pad. After I assembled it together, I chose one of the punch outs to decorate the box. There is so much product just in the 12x12 paper pad! 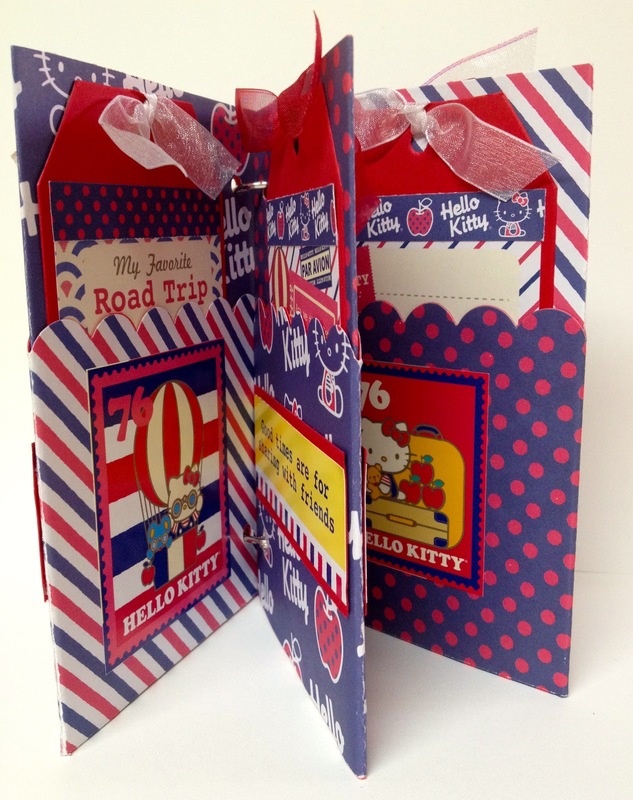 And lastly, I decided to make a mini scrapbook album. I used a Sizzix pro die called pocket page and tag to cut the mini album. I used the different lists from the small memo pads and glued them on to the tags. It was so easy to assemble everything. Here's the tag that I placed in the front cover. This is the 2nd page of my album. I used stickers from the 12x12 paper pad to decorate all the pages. These are the different lists that I placed on each tag. Here is the 3rd page of my album. And the lists that I used for these tags. Here is the back of the album. And the list that I used for the last tag. Here's a view of the album opened. I used metal circle rings to hold everything together. And now for the "giveaway"!!! Do you like free stuff? Especially if it's Hello Kitty stuff? 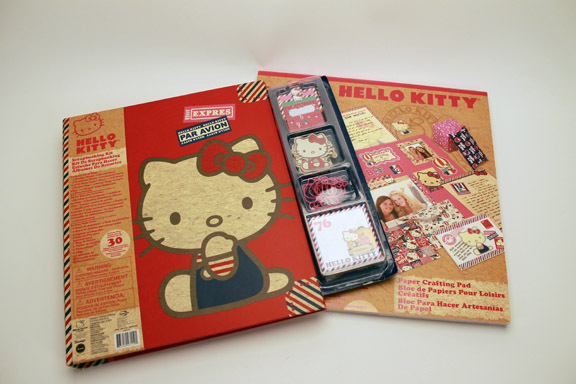 Well, here's your chance to win a package of these Hello Kitty scrapbooking products. Just leave me a comment and if you just want to say hi, that is fine too. I will draw a winner on Wednesday, October 31st Halloween. Please make sure there is some way for me to contact you too. Winner needs to be 18 years or older and a US resident. The package will be shipped directly from Horizon Group USA. Thanks for stopping by today and have a great week!!! Hi and happy Friday!!! I can finally post this because I had to make a bunch of them for tomorrow's stamp card get together. I cut this witches hat on my Eclips using the Ecal and SVG cuts. When you lift the triangle piece, the candy sits in the box which is sitting on the circle part of the witches hat. Sorry, I forgot to take a photo of it. I cut the bat using the spooky cuties file from SVG cuts. I used distress ink on the edge of the bat so it would stand out on the hat. This past Monday, my husband and I went to eat brunch at this place in Kilohana Square called "Sweet-E's". Omg, the food was so ono! 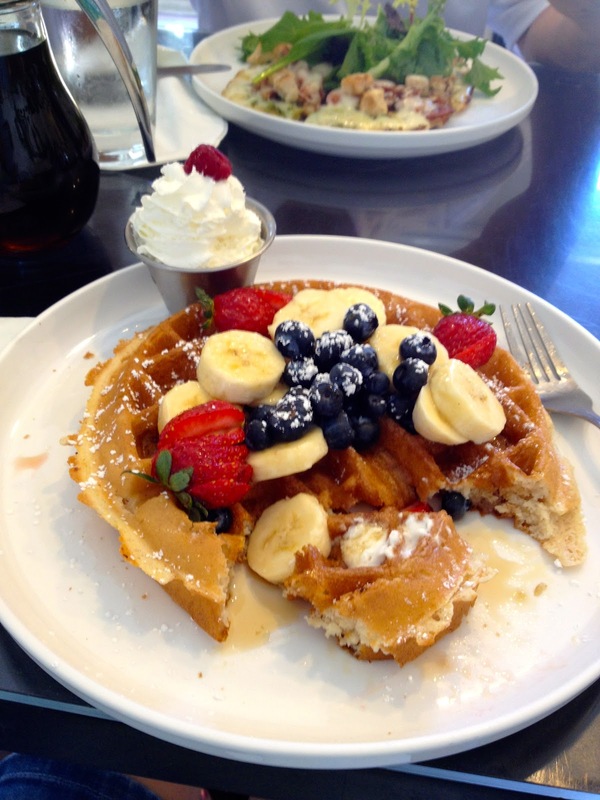 I had the waffles with fruit. And I remembered to take a photo of it after I had couple bites. Ha! 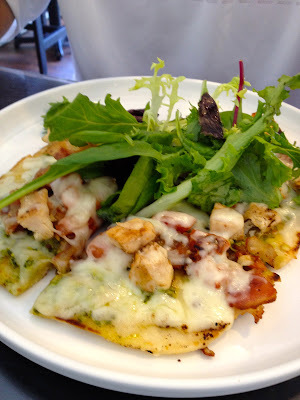 My husband had the chicken pesto meal. It looked like a pizza but it was actually a pita bread with chicken, cheese and pesto sauce. If you've never been there, go and try it out. The decor is country cottage beachy theme. Well, the weekend is here and hope you all have a great one!!! Thanks for stopping by my blog today! Hi and happy Thursday! 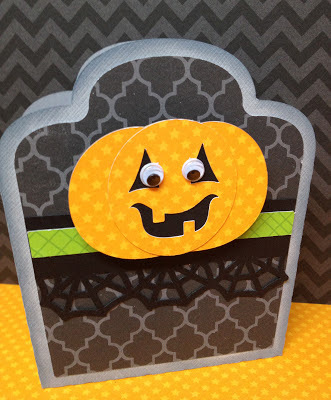 Lately, I've been using my Eclips machine to cut out favor boxes for Halloween. SVG Cuts has a new one for Halloween called "gimme candy boxes". This is the first box that I made. It is in the shape of a tombstone. So cute! Everything I cut is on the svg file. Even the spiderweb border. I wanted to give the pumpkin more dimension and movement so I put an action wobble thingy behind it. The 2nd photo looks blurry because I was trying to take the picture of the pumpkin in action. I stuck on those googlie eyes which I found at Ben Franklin Crafts. 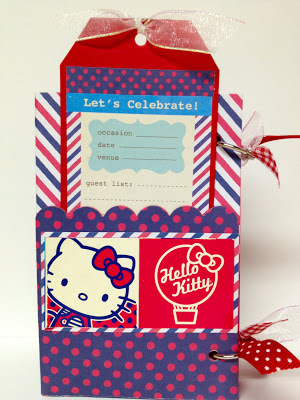 I'll be back with another favor box that I cut from the same file.